Following on from the triple threat match last week, the tag team partners of last week's competitors did battle here tonight. It was another fast-paced battle, with all three men getting their fair share of offence in. The Natural spent a little time on the outside nursing an injured mid-section, and in the end, he was the man pinned following a 'Studd Stopper' Stunner from Christian Price! NOTBPW General Manager Alex DeColt arrived on the stage, and shouted that he knew exactly how to handle the three teams... He said he's going to take the vacant Tag Team Titles... and hang them above the ring... Then the three teams can compete in the first ever NOTBPW Triangle Ladder Match!! The CanAm Blondes... World's Most Wanted... and Cameron Vessey & Christian Price... New Champions guaranteed!! After an impressive month of May, which included three victories and a close loss to then Tag Team Champions: World's Most Wanted, The Mavericks looked to kick start their June with a win. They were up against two young stags who both weigh in at around the 250lb mark. Despite their size and ability, they were no match for the experienced duo of John Maverick and Julian Watson! For the finish, Watson hit his 'Tiger Claw DDT' finisher on Ancrie. NOTBPW General Manager Alex DeColt arrived on the stage next, and Hugh Ancrie and Mark Griffin looked worried... We've seen the power-hungry GM FIRE five wrestlers since his arrival as the man in charge, but he wasn't there for them this time... He was there for The Mavericks... He said that due to their winning form, John Maverick and Julian Watson were an easy choice for his pick as the opponents for Dan DaLay and Derek Frost!! Two youngsters with bright futures battle 1 on 1 here for the first ever time. There was a lot of mutual respect between the two men in their early 20s tonight, and both men could have won the match. Solomon Gold hit a brilliant suplex, and followed it up by locking Sonny Wildside in his 'Gold Standard' Sleeper. The move almost earned Gold his first victory in NOTBPW, but Wildside made it to the ropes! From then on, 'The Man Without Fear' unleashed some high-flying and high-impact moves. Ending it eventually with his 'Fear Factor' Moonsault Stomp! Excellent work in this tag team match, just two weeks after Wade Orson made his debut in a singles match against Lord James King. On that night, Orson won, but King used dastardly tactics and a set of brass knuckles to knock Orson out. Tonight, Orson was furious with King, and King cleverly used that anger against the young Brit. He used his tag team partner Akima Brave a lot more effectively than Orson used Harrison Hash. In the end, King punched Orson with the brass knuckles again, behind the referee's back, and it allowed Akima Brave to make the pin! This was an exceptional match between two potential future mega stars. The story of the battle was James Hernandez's inability to hit his 'Apparition #14' Spear on Erik Strong, who blocked the effective finishing move three times in a variety of ways. He used a DDT, a front face lock, and a brilliantly timed knee strike! For the finish, Strong leapfrogged the spear attempt, but as he turned around, Hernandez exploded back at him and planted him with the move! Big finish, and a big win! For the first time EVER in NOTBPW, 'The Young Gun' Ricky DeColt was set to go 1 on 1 with 'The Wild Man' Jack DeColt... 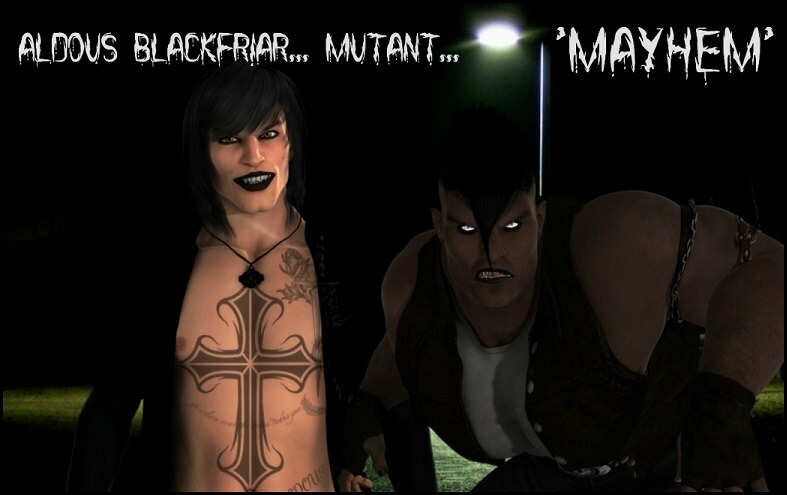 Brother versus Brother... 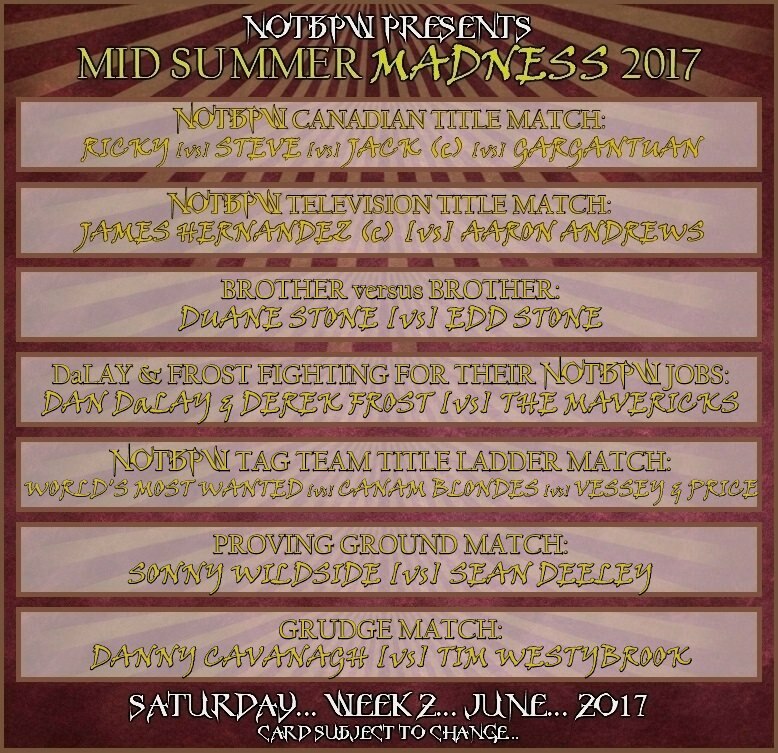 The two DeColt Brothers have been on the same side of many battles in their eighteen months with the company, but at Mid Summer Madness they will be on opposite sides of the ring in a Fatal-4-Way Match for Jack's NOTBPW Canadian Title... Tonight, with the chance to gain some momentum, it's Ricky and Jack, 1 on 1...!! When two wrestlers compete 1 on 1 for the first time, there are varying levels of potential instant chemistry. Ricky and Jack's instant incredible chemistry is due in part to the fact that they are brothers, and also due to their years of teaming up as a tag team. In an open and even first half of the match, both men had opportunities to pick up a huge win. However, around the seven minute mark, Jack DeColt suddenly took control! He slammed Ricky's head into any and every hard surface he could find both in and around ringside. Every time he slammed Ricky's head down, he shouted at his younger brother that things could have been different. He still blames Ricky for ending their relationship, when Ricky entered, and won, the Super Slam Battle Royale! Things were looking good for a Jack DeColt victory, but the match ended as a contest when Gargantuan arrived! The crowd chanted for Steve DeColt over and over again... And finally, after Gargantuan looked like he was finished with Jack and Ricky, 'The Outsider' made an appearance... Steve was shown standing up in the bleachers, wearing a leather jacket and jeans... He glared at the ring as Gargantuan begged him to come on out of the crowd and fight him... But Steve just stood there, glaring... We have just one more episode of NOTBPW Championship Wrestling before Mid Summer Madness... The card is filling up fast... and in the Fatal-4-Way for the NOTBPW Canadian Title it's looking increasingly unlikely that anyone can stop 'The Monster' Gargantuan! !